After picking on dried cranberries last week (see: The Truth About Dried Cranberries), I decided to feature the fresh variety. In case you are wondering, I have received an e-mail from Ocean Spray over all of this and I find it quite interesting. I am working on a post regarding their response. In the meantime, Snack Girl is NOT anti-cranberry. I live in Massachusetts where the mighty cranberry is harvested and I get excited when bags of fresh cranberries start hitting the produce section. They are here!! For those of you who like your cranberries in the shape of a can, it is time to GROW UP and try them fresh. I'm not sayin' you should give up on your can, I'm just suggesting that you try the fresh version because they rock. What to do with them? On the side of the cranberry package you will find some suggestions for great cranberry sauces that are simple to make or you can check this one out on the Food Network. I also like to use them in muffins and since cranberries are sour - a good combination is cranberries and cornmeal. The cornmeal has a sweeter flavor than regular flour and helps out with the sourness of the cranberry. In this muffin recipe, I substituted buttermilk for BUTTER which is a great trick for lowering calories without compromising flavor. They are so much healthier for you than the 540 calorie, 26 grams of fat MUFFIN MONSTER that I featured here: This Blueberry Muffin Has a Dark Secret. My son inhaled these and liked them for breakfast. They are great with coffee or espresso and I have one for an afternoon snack. What do you make with fresh cranberries? Preheat oven to 400F. Line muffin cups with paper liners. Coarsely chop cranberries in food processor or with a chef's knife. Mix dry ingredients in large bowl and then add wet ingredients and cranberries. Mix until just combined. Fill muffin cups close to the top and bake until golden (about 20 minutes). Enjoy! Freeze some for the future. I just read this post and the one on dried cranberries. We don't have 'Crasins' over here in the UK so our dried cranberries tend to be ok but I am still wary of their sugar content and don't go overboard. Fresh cranberries are the way to go and these look lovely. I like to make my own cranberry sauce for Christmas turkey! I love fresh cranberries!!! One of my favorite fall fruits, yet growing up as a kid I hated them!!! But now I LOVE them!! Once again Snack Girl you've given us a delicious recipe!! I'm going straight to the store after work so I can make these treats tonight. And thanks for the buttermilk for butter trick. I will have to try it in other receipes too. I love making cranberry sauce from fresh berries. It tastes nothing like canned and I think it tastes better. My dad and I (well, mostly I doddled) used to pick cranberries on a local bog. It wasn't flooded like they do for commercially-grown ones, although it was damp (and usually cold - because it was very much exposed to the ocean). He always made our cranberry sauce from fresh - never would he have had a can of pre-made in the house. Love being able to stock up on fresh - throw them in the freezer - add them to steel cut oats or quinoa when cooking them for breakfast - wonderful. Am going to attempt dehydrating - but will have to cut each in half, as they're too big to dry properly, I believe. Its such a lovely recipe. Fantastic! Any ideas on using fresh cranberries in a carb-free recipe? I think I've made these before. would be great for breakfast on Thanksgiving (or the day after, before hitting all the sales!). Hi, Snack Girl! Just a question on this recipe and another one you had posted. Can skim milk be used in this recipe and others you have posted? You give the WW points for low-fat milk. I only buy skim, so I was wondering if it is okay and what the point difference would be, if you know. Thanks for your great posts!! Yes, autumn in New England is the time to make the easiest cranberry sauce: 1 pound cranberries, 1 cup water, 1 cup sugar. Bring to a boil, and boil for 10 minutes. That's it! I store it in a large glass jar in refridge. Love it -- I'll dig in my freezer now to see if I have frozen cranberries handy. I love buttermilk - I just made banana bread pre-Sandy, and pancakes yesterday. So may have just enough to do make these corn muffins. You made me realize that I've never had fresh cranberries before! Just made these with fresh cranberries. I like your afternoon snack suggestion, as something about the cornmeal texture makes them not as "breakfast-y" to me as I would normally think a muffin may be. A cranberry chutney is always nice with a holiday meal (nice accompaniment to poultry, ham, beef). Then it can be spread on a turkey sandwich/panini or I really enjoy it with cottage cheese for breakfast! 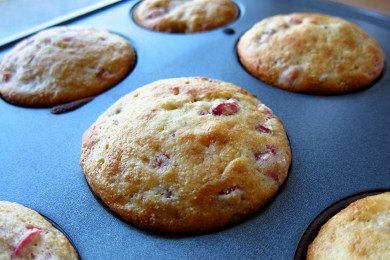 I've been hoping you'd post a muffin recipe for cranberries! I've been wanting to buy a bag as soon as they arrive here in Texas... any idea though for what I can substitute the cornmeal with ? I'm deathly allergic to corn, and so... but I have no ideas what else could be used. I can't have buttermilk-any ideas on substituting for it? I can do almond milk w/ lemon juice or butter. Any thoughts? I'm on a low-casein gluten-free diet, but I am allowed to have butter. Thanks for the recipe-I'm looking forward to trying it! Just made these! I confess I made a couple changes based on my fave muffin recipe - I doubled the baking powder to make them extra light, added about 1/4 cup olive oil & I did use whole wheat flour. They are yummy! My kids loved them too!